All light bulb sockets should pass 4 quality inspections before loading. 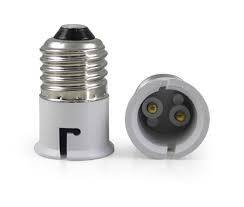 Light bulb socket adapter is available for B22 LED/CFL lamp converter E27/E26. B22 To E27 Adaptor, a lamp holder to convert a bayonet cap fitting to an Edison screw fitting. Suitable for all voltage (This product is only socket converter, it does not convert electrical voltage) . A light bulb socket converter for the light bulb with E27 base to adapt an B22 screw fitting socket .